HDTV Supplys WolfPack 1x2 SDI Distribution Amp with an OFF/ON Switch sends a single SDI video signal data to up to 2 - SDI TVs at the same time. This 1x2 SDI Distribution Amp is specially designed with an equalizer IC on its input and drive ICs on all of its outputs able to support long coaxial cable up to 600 feet without any signal loss in the splitting process. The WolfPack 1x2 SDI Distribution Amp supports almost all video formats and is SMPTE compliant. The 1x2 SDI Distribution Amp can also achieve up to 1080p @ 60Hz for Full HD output performance. The 1x2 SDI Distribution Amp only supports video and does not support audio. The 1x2 SDI Distribution Amp will not introduce any delay to the video signal and therefore perfect for professional broadcast applications. You pay a lot more from Brand AJ... and Brand BL.. when you can get the professional 1x2 SDI Distribution Amp for <$150 with its outstanding specs. Why not buy this 1x2 SDI Distribution Amp with OFF/ON Switch today? Why not buy this 1x2 SDI Distribution Amp today? HDTV Supply includes a 5 Year U.S. Limited Warranty on this product. There are two bundled parts to this 5 year warranty. The 5 year warranty is only for the main device you purchased and does not include any product options or additional products you purchased at the same time. FIRST YEAR: The first year is direct with HDTV Supply at 800-841-9238. The warranty states that the Product will perform substantially in accordance with the supplied written materials and Product information located on this Product web site page for a period of 1 year from the date of shipment of the Product and that the Product will be free from defects in materials & workmanship under normal use & service for a period of 1 year from date of shipment. In order to get a warranty replacement for a defective item within the first year call HDTV Supplys Tech Support Team with your order number at 800-841-9238 and they will verify the product is eligible for a warranty repair. An RMA number will then be issued via email. Shipped replacements will be in like new condition, tested and all components included. Please read HDTV Supplys Warranty Terms and Conditions for more. 2ND THROUGH 5TH YEAR: The 2nd through 5th year are direct with Consumer Priority Extended Warranty Service (CPS) as they are HDTV Supplys extended warranty provider. They are a large 3rd party repair company with facilities throughout the U.S. and offer our U.S. customers unparalleled product coverage and repairs. If after calling HDTV Supply, at 800-841-9238, we find we can't fix the issue over the phone, and you need a repair, you will henceforth deal directly with CPS for the repairs via their toll free phone number (800) 905-0443 Option 3 during the 2nd through 5th year. 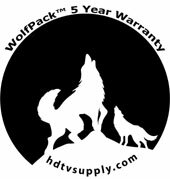 You can also email CPS and email HDTV Supply as well as call us a 800-841-9238 if you have any questions with this 5 year bundled warranty.